Whenever Apple releases a new version of Mac OS X, two things are certain. First, it will be better than the previous version. Second, there will be things about it people aren’t that happy about. Leopard is no exception, and among the biggest early complaints have to do with its interface: the new Dock, the partially-transparent menu bar, lined Finder windows—in other words, the things you’ll be looking at whenever you’re using your Mac. As I did back when Tiger was first released, today I’m going to take a look at some of the first tools for tweaking Leopard’s interface. If you’re one of the people who isn’t completely thrilled with the new look, it’s possible to make Leopard’s appearance not only bearable, but perhaps even enjoyable. Note that some of these products are still in development, so the usual “use at your own risk” caveats apply; however, I’ve tried them all on my own Mac without incident. For the cautious, those programs designated with ** alter system files to work their magic; the others simply modify hidden preferences. Perhaps the most controversial aesthetic change in Leopard is the new look of the Dock—a 3-D, reflective “shelf” on which icons appear to sit—when positioned on the bottom of the screen. The Leopard Dock has been criticized for being ugly; for not adhering to Apple’s own user-interface guidelines; for being visually difficult to use; and for being eye-candy-for-the-sake-of-eye-candy. If any of these criticisms represent your own feelings, you likely saw my article explaining how to apply the 2-D look of the side-mounted Dock to the bottom-of-the-screen version using a couple simple Terminal commands. But if you’re not a fan of Terminal, there are already many handy utilities for making the change with a click or two. Among my favorites are the free TigerDock 1.0 (donations accepted), which also has an option to “dim” hidden applications—a feature I’ve been using on my own Dock (thanks to third-party utilities) for years. Alternatively, if you’re a fan of Dashboard, the free DockDoctor widget lets you choose the 2-D or 3-D look with a couple clicks. And Rob Griffiths was kind enough to improve my own AppleScript utilities (provided in the previous article), combining them into a single utility that toggles the Dock’s appearance each time it’s run; you can download the new version here. Another interesting tweak is provided by Elgebar Studios’ free DockColor **, which lets you change the color of the 3-D Dock’s reflective shelf. You just choose the desired color, click on Apply, and then provide your admin-level username and password; your Dock will be relaunched with its new paint job. DockColor even backs up the original Dock files; choosing File -> Revert To Default resets the Dock to its default appearance. If the Dock’s new appearance is Leopard’s most controversial aesthetic change, the semi-transparent menu bar isn’t far behind. The new look, designed to make the menu bar less distracting, at times makes it less usable—menu titles and menu-bar icons can be difficult to read with certain Desktop pictures. Using a solid color, rather than a complex image, as your Desktop background helps, but many people would rather just revert to the white menu bar they’ve been using for years. Unfortunately, there’s currently no easy and 100-percent effective way to do so. You can manually edit your favorite Desktop images so that the top-most 20 pixels of each, when sized appropriately for your Mac’s display, are white. But that’s a hassle. LeoColorBar requires more manual effort but provides more options. 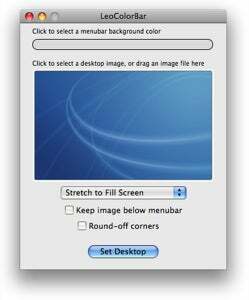 You drag the desired image into the LeoColorBar window, choose the menu-bar background color (for example, white for the traditional Mac OS look or grey for a less-bright bar), choose your display options, and then click on Set Desktop. For those who just want to click on a button to get the older Mac OS X menu bar back, I’m confident that we’ll see a simple, one-click method before too long. Given that Mac OS X automatically disables the menu bar’s transparency on older Macs that don’t support CoreImage, it seems there must be a way to disable this, um, feature on newer Macs, as well. Likely the most-criticized functional change in Leopard is Stacks, the feature that lets you put a folder in the Dock and then see a graphical display of that folder’s contents by clicking on the folder in the Dock. Although Stacks has some benefits, it also has a number of issues that affect its usability. (I’ll cover both in my in-depth take on Stacks, which should appear later this week on Macworld.com.) Easily the biggest step backwards, compared to Tiger, is that you can no longer navigate a folder’s contents, including the contents of subfolders, via the Dock. Unfortunately, no one has yet discovered a hack or tweak to get this functionality from Leopard’s Dock. Until someone does—or until Apple restores the feature—the best you can do is find another way to access your files. 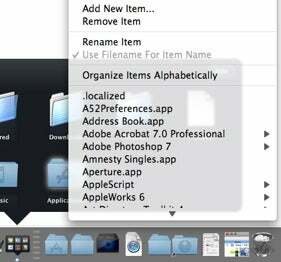 Thankfully, there are a number of OS X add-ons out there that provide similar functionality. Two options that are somewhat similar in their basic functionality are Overflow and DragThing . Each gives you a pop-up, palette-looking window for quick access to files, folders, and applications. For example, click on Overflow’s Dock icon to access any folders you’ve added to Overflow; right-click on a folder to navigate its contents. (DragThing works similarly and has more features than Overflow.) This requires two clicks instead of the Tiger Dock’s single click, but it’s still faster—and more convenient—than Stacks for those of us who frequently took advantage of hierarchical Dock menus. 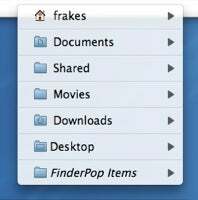 There are also dozens of other utilities available for Mac OS X, many of them now compatible with Leopard, that provide hierarchical menus for accessing files and folders. Still, I’m sure I’m not alone in wishing that this feature was still available directly from the Dock. Another minor complaint I’ve heard is with Leopard’s login window: What’s with the Time-Machine-inspired space theme? If you’d rather have something a bit less, well, spacey , you need to replace the file DefaultDesktop.jpg , found in /System/Library/CoreServices, with a similarly-named image of your choosing. Unfortunately, as a system-level file, it’s a bit of a hassle to replace. 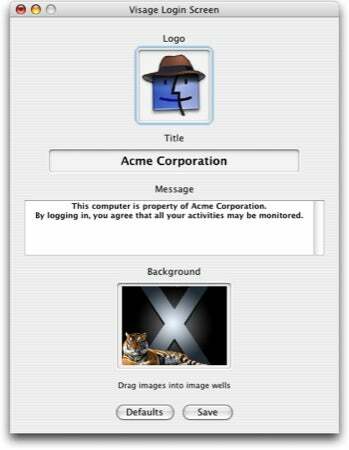 (Under older versions of Mac OS X, the login image wasn’t a system-level file.) The easiest solution, although not a free one, is Sanity Software’s $5 Visage Login **, which lets you change the login background, icon, title, and message text; you can revert to the default appearance at any time. Another minor tweak in Leopard that some people haven’t embraced is the look of folders in the Finder. Folders in general have lost their 3-D appearance, and, perhaps more controversially, special folders—those inside your user folder, as well as the Applications and Utilities folders—no longer sport colorful, custom icons for easy identification; instead, you get subtle, “embossed” labels. One simple solution, if you’ve still got a copy of Tiger sitting around, is to copy the icons from Tiger’s special folders and paste them onto the corresponding folders in Leopard. For more options and less hassle, the upcoming version of Panic’s $13 CandyBar ** (details here ) will let you replace all system and special icons with a click; it will even support Leopard’s new 512-by-512-pixel icons. Finally, two other minor changes to OS X’s appearance have generated complaints: the alternating-blue-and-white-stripes look of Finder windows in list view and the squared-off corners of the screen. (Didn’t notice the latter change? Neither did I until someone pointed it out.) If you’d rather your list views look like they did in Tiger—solid white—Doug Adams of Doug’s AppleScripts for iTunes fame provided a handy AppleScript over on Mac OS X Hints. I’ve turned that into a simple AppleScript utility you can download here. Run the program and you’ll be asked if you want to show stripes in list view; click on Yes or No, and the Finder will restart sporting the chosen look. If you’re not a fan of Leopard’s new squared-off screen corners, and would prefer the traditional Mac-like rounded corners, Many Tricks’ Displaperture can restore them; in fact, you can choose exactly which corners use which look—rounded or squared—and even adjust the radius of roundedness, making your Mac look like an old TV. Unfortunately, your corners stay rounded only while Displaperture is actually running, and if you’re using Leopard’s Spaces feature, the modifications affect only the current workspace.